Home→Conference→How to give a good paper presentation at an academic conference? In this blog post, I will discuss how to give a good paper presentation at an academic conference. If you are a researcher, this is an important topic for you researcher because giving a good presentation of your work will raise interest in your work. In fact, a good researcher should not only be good at doing research, but also be good at communicating the results of this research in terms of written and oral communication. Giving a good oral presentation starts with a good preparation. One should not prepare his presentation the day before the presentation but a few days before, to make sure that there will be enough time to prepare well. A common mistake is to prepare a presentation the evening before the presentation. In that case, the person may finish preparing the presentation late, not sleep well, be tired, and as a result give a poor presentation. Preparing a presentation does not means only to design some Powerpoint slides. It also means to practice your presentation. If you are going to give a paper presentation at a conference, you should ideally practice giving your presentation several times in your bedroom or in front of friends before giving the presentation in front of your audience. Then, you will be more prepared, you will feel less nervous, and you will give a better presentation. It is also important to understand the context of your presentation: (1) who will attend the presentation? (2) how long the presentation should be ? (3) what kind of equipment will be available to do the presentation (projector, computer, room, etc.) ?, (4) what is the background of the people attending the presentation? These questions are general questions that needs to be answered to help you prepare an oral presentations. Who will attend the presentation is important. If you do a presentation in front of experts from your field the presentation should be different than if you present to your friend, your research advisor, or to some kids. A presentation should always be adapted to the audience. To avoid having bad surprises, it is always better to check the equipment that will be available for your presentation and prepare some backup plan in case that some problems occur. For example, one may bring his laptop and a copy of his presentation on a USB drive as well as a copy in his e-mail inbox, just in case. It is also important to know the expected length of the presentation. If the presentation at a conference should last no more than 20 minutes, for example, then one should make sure that the presentation will not last more than 20 minutes. At an academic conference, it is quite possible that someone will stop your presentation if you exceed the time limit. Moreover, exceeding the time limit may be seen as disrespectful. When giving a presentation, there are a few important rules that should always be followed. One of the most important one is to always look at your audience when talking. One should NEVER read the slides and turn his back to the audience for more than a few seconds. I have seen some presenters that did not look at the audience for long periods of time at academic conferences, and it is one of the best way to annoy the audience. For example, here are some pictures that I have took at an academic conference. 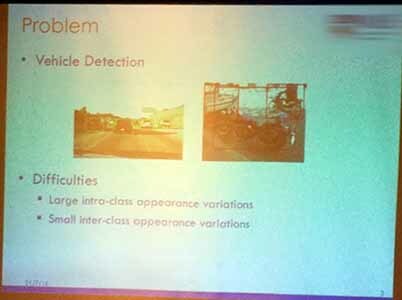 In that presentation, the presenter barely looked at the audience. 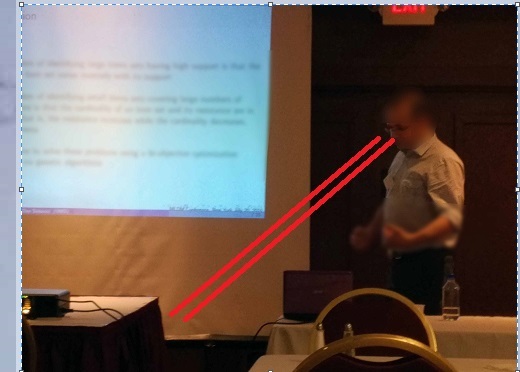 Either he was looking at the floor (first picture) when talking or either he was reading the slides (second picture). This is one of the worst thing to do, and the presentation was in fact awful. Not because the research work was not good. But because it was poorly presented. To do a good presentation, one should try to look at the audience as much as possible. It is OK sometimes to look at a slide to point something out, but it should not be more than a few seconds. Otherwise, the audience may lose interest in your presentation. Personally, when I give a presentation, I look very quickly at the computer screen to see some keywords and remember what I should say, and then I look at the audience to talk. Then, when I go to the next slide, I will briefly look at the screen of my computer to remember what I should say on that slide and then I continue looking at the audience while talking. Doing this results in much better presentation. But it may require some preparation. If you practice giving your talk several times in your bedroom for example, then you will become more natural and you will not need to read your slides when it will be the time to give your presentation in front of an audience. Other important things to do is to talk LOUD enough when giving a presentation, and speak clearly. Make sure that even the people in the back of the room can hear your clearly. This seems like something obvious. But several times at academic conferences, there are some presenters who do not speak loud enough, and it becomes very boring for the audience, especially for those in the back of the room. Another good advice is to stand when giving a presentation. I have ever seen some people giving a presentation while seated. In general, if you are seated, then you will be less “dynamic”. It is always better to stand up to give a presentation. In this picture, the problem is that there are too many technical details, and formulas. 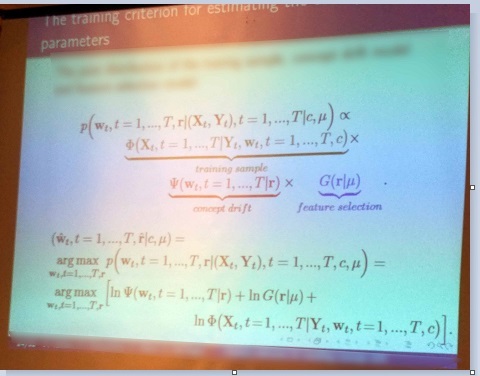 It is impossible for someone attending a 20 minutes presentations with slides full of formulas to read, understand and remember all these formulas, with all these symbols. 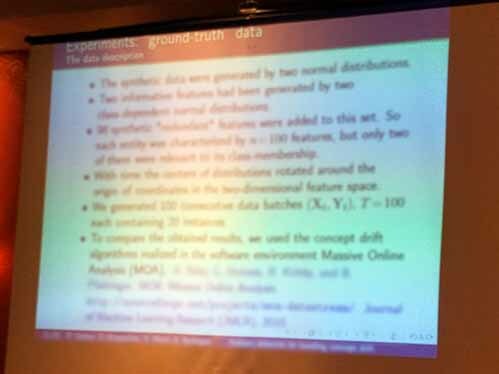 In general, when I give a presentation at a conference, I will not show all the details, formulas, or theorems. 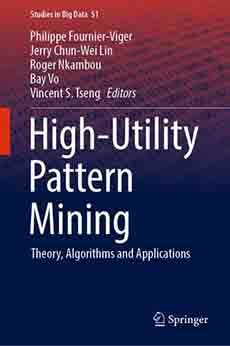 Instead, I will only give some minimum details so that the audience understand the basic idea of my work: what is the problem that I want to solve and the main intuition behind the solution. And I will try to explain some applications of my work and show some illustrations or simple examples to make it easy to understand. Actually, the goal of a paper presentation is that the audience understand the main idea of your work. 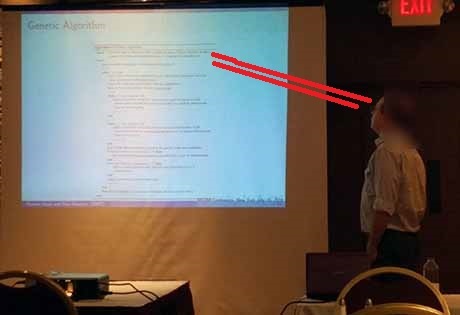 Then, if someone from the audience wants to know all the technical details, he can read your paper. If someone do like in the picture above by giving way too much technical details or show a lot of formulas during a presentations, then the audience will very quickly get lost in the details and stop following the presentation. This slide has just enough content. It has some very short text that give only the main points. And then the presenter can talk to explain these points in more details while looking at the audience rather than reading the slides. There are also a lot of other things that could be said about giving a good presentation but I did not want to write too much for today. Actually, giving good presentations is something that is learned through practice. The more that you practice giving presentations, the more that you will become comfortable to talk in front of many people. Also, it is quite normal that a student may be nervous when giving a presentation especially if it is in a foreign language. In that case, it requires more preparation. Hope that you have enjoyed this short blog post. Thank you for the information. It was certainly helpful. You are welcome. Thanks for reading the blog and posting feedback! Thanks for the useful post. Long time no talk to you. Hope that everything well, sir. I often visit your blog and read some interesting topics here. If you have free time, I hope I can get in touch with you regularly, thanks! Yes sir, I know you are working in China. You are very well-known recently. We also look forward to the result, quite long, approximately a year. I will inform you regularly. Ok Thanks. Let’s keep in touch. Thanks lot. This post is very useful!